Don Draper is the Devil. 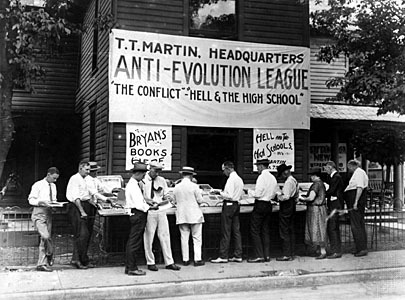 On March 13, 1925, the Tennessee Senate passed the Butler Bill which banned the teaching of evolution in public schools. The law had already passed the state House of Representatives in January. It was signed into law by Gov. Austin Peay on March 21, 1925. It was the cause of the famous Scopes Monkey Trial in Dayton, Tennessee later that year. Although the law was repealed 42 years, the debate over evolution continues, to varying degrees, in school jurisdictions and academic circles across the country. Actually, every day in America seems like there is a monkey trial of one sort or another taking place whether it be about evolution, global warming, vaccinations or any number of other issues being scrutinized. 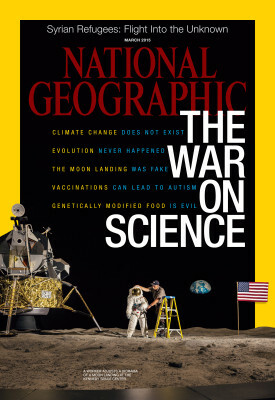 The March issue of the highly respected National Geographic has a cover proclaiming “The War on Science” and explores the current “Age of Disbelief” in which scientific evidence about many issues is discounted and dismissed by mostly politically and religious conservatives but, also, on some issues, by some liberals, too. One of the first things I tried to teach my children was the difference between these two statements: 1.) This is chocolate ice cream and 2.) Chocolate ice cream is the best ice cream. The first statement is a fact, the second is an opinion. Unfortunately, segments of our society now contend that just because they believe something, it is therefore true. That is not what made America great. America, for better and sometimes worse, has always challenged the status quo. Progress does not come from entrenched beliefs based on want or need. Progress comes from exploring and problem-solving based on curiosity and acquired knowledge. And while well-trained and educated people can sometimes look at the exact same data and evidence and come to different conclusions, no one can claim that the obvious evidence indicates the sun rotates around the earth. That is what it looks like, but that simply isn’t what is happening. I can’t and won’t debate each and every issue here. 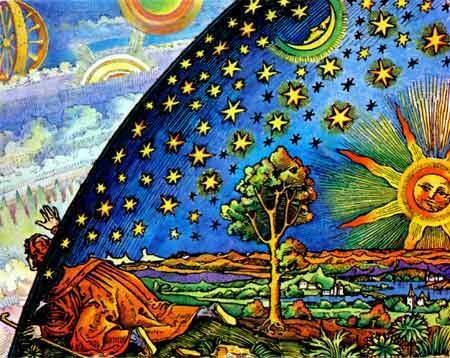 While I do not believe that science is infallible, I generally trust it over superstition, ignorance and political divisiveness and pig-headedness. I also believe the mechanics of a tree or the lifecycle of water are not political. And I believe we must educate ourselves so we understand, for instance, that, despite what politicians say, there is no such a thing as “American oil.” The oil belongs to the companies who drill it and refine it and most of them are not American and, besides, they can sell it wherever they get the best price. Most disturbing trend, though, is what is called “intellectual dishonesty” meaning a person knows better but chooses to parrot or espouse weak or disproven or even silly notions for some of the afore mentioned reasons. We need problem-solvers, not witch doctors, demagogues and deniers of truth. We need old people to remember what it was like to put men on the moon and for young people to begin dreaming big and doing big instead of day dreaming and living in virtual realities. There is work to be done that requires sound minds and honest hearts and a firm grip on reality. The stakes are high and time is short. Make a better tomorrow based on reality.